100% Natural Bamboo Viscose (rayon from bamboo fiber) 250-Count Twill Linens. 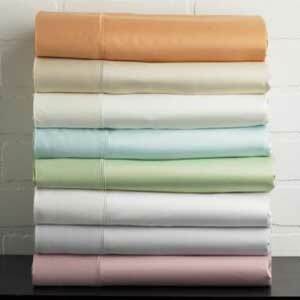 Naturally soft and exceptionally comfortable, Bamboo bed linens are here to stay! The unique structure of Bamboo viscose provides for superior ventilation & wicking action, keeping you cool and comfortable even on the hottest summer evenings. These soft, thick Bamboo viscose fiber sheets with their relative thickness provide warmth, even on the coldest winter nights. Easy to care for, outstanding colorfastness and naturally anti-bacterial, our Bamboo linens may be the most eco-friendly bed linens on the planet. Now available in several great colors. Top hems and pillowcase cuffs sewn with our sherry stitch. Oversized to fit extra thick, pillowtop mattresses! Colors:(Stack image from top to bottom): Copper, Hemp, Ivory, Sky, Grass (discontinued), White, Silver Birch (discontinued) Lotus (discontinued).